During past Coach Rallies, awards have been handed out to individuals who have made significant contributions to the Network. Warren was recognized for his amazing contributions to Open Standard practice via the TNC Conservation Action Planning (CAP) Workbook – a masterpiece of Excel programming that supported the application of CAP/Open Standards before Miradi existed. (Read by Dan Salzer) “In July of 2005, David approached The Nature Conservancy with an offer to volunteer. David had over 35 years of experience in database design, development, and testing. It was clear from my first meeting with David that he was deeply passionate about the Conservancy’s mission and eager to find a way to make a substantial contribution. The timing was great – we were just gearing up for a big project that would create a major breakthrough for the Conservancy. For years, we had been managing critical conservation information for our work around the world on local desktop computers using the CAP Excel workbook. We had over 500 of these Excel workbooks with valuable information on biodiversity, threats, actions, and measures. Yet this information was not accessible beyond individual local offices. This made it really hard for people to connect and learn from others working on the same kinds of conservation issues elsewhere in Oregon, the Pacific Northwest, or in the world. David saw the same potential as those of us launching this project – there was an opportunity to multiply the conservation impact that the Conservancy was having by creating a powerful, searchable web-database that talked directly to our desktop tool. David agreed to join the core team working on the Conservation Project Database (or “ConPro”) as a Volunteer Data Management Specialist. David’s contributions were instrumental in the successful development and release of the ConPro database, which launched in January 2007. David has now contributed over 2500 hours to The Nature Conservancy, nearly all of that associated with the ConPro database project. David’s ability to make substantive contributions from his home in Eugene makes his contributions even more incredible. The ConPro team is based in Portland, OR and Arlington, VA, but David lives in Eugene. He never hesitates to hop on Amtrak to come to Portland (he doesn’t drive in order to save fossil fuels) – but he does all his volunteer work from his home, without the benefit of face-to-face interaction or supervision from other team members. In addition to the incredible amount of time and effort that David put into the ConPro project, I also want to share that he is a real pleasure to work with. David is one of the most considerate, pleasant, and fun people that I’ve had the opportunity to work with in my 18 years with The Nature Conservancy. His communication style is professional, constructive and very upbeat. At the 2008 Rally, Bruce was recognized as the first non-TNC-staff participant in a coaches training. Bruce’s participation marked the start of the evolution of TNC’s Efroymson Coaches Network to the current Conservation Coaches Network. During the same 2008 Rally, a new strategic plan was presented to the coaches, and they went on to approve the expansion of the community from a TNC project to a larger, multi-institutional global partnership. Because of the hard work of this first person, there is a thriving community of coaches working together across multiple organizations on an entire continent. Without Pip Walsh there would be no Australia Franchise and really it was Pip’s work designing and leading a team of coaches from multiple organizations that inspired us to even imagine a partnership community beyond The Nature Conservancy. Pip has enormous insights, instincts and talent in the area of systems thinking and has lent that skill in many ways to the network. In addition to recruiting and coordinating the Australia mob, really well I might add, she participated in the core strategic planning team, hosted coach training, led fellowship workshops and helped with planning this rally, all the while holding high level management positions in Greening Australia. This next person has been active in the network since 2005. He led a TNC franchise unit in the Southern US for four years. He was there when we wrote our first strategic plan in 2005 and contributed thoughtfully to the second plan. He served on every one of the four Rally planning teams, led multiple Efroymson fellowship workshops. And helped with partner trainings “across the pond” on several occasions. Rob Sutter has been a major force for evidence-based conservation in TNC and beyond and now in his own business, Enduring Conservation, Rob continues to support the coaches network with grace and good humor. This next person will be known to many of you because he really gets around. He’s helped his fellow coaches in the Caribbean to develop protected area plans with partners, he has helped coaches in Belize, in Missouri, Canada, in Australia. He has helped train new coaches, been on two Rally planning teams and the strategic plan core team. In fact, he is there when any of us has needed him. From elegant whooping cranes to slimy eels, George Schuler has never seen a life form he wasn’t willing to root for. In George’s day job he manages field projects in New York state and I don’t think his title has anything to do with “planning.” And I think that this is one of reasons we value George’s help so much, is because he isn’t facilitating a process, he is really coaching for conservation success. He isn’t trying to score any points for himself, he is really trying to help us to win conservation gains where ever we are. This next person has nurtured the Coaches Network from the first moment the idea was conceived by Greg Low, Karen Poiani and her. She chartered the first franchise unit in the Pacific Islands, led several Efroymson fellowship workshops and launched several new network leaders. She led both of our strategic planning processes and the process to develop the CCNet charter. She was the first chair of our partnership. She has been my counselor and friend every step of the way and has doubtless cashed in plenty of personal and professional chits in order to serve this community. There would be no Coaches Network without Audrey Newman. Audrey understands the value of distributed knowledge and the power of empowering others probably better than anyone I have ever known. This next person had his first taste of the CAP approach to the Open standards in a partnership process that focused on the Bering Sea in 2005. Ever since, he has been a leader and an advocate for the Open Standards in WWF. And while it wasn’t John Morrison’s job to arrange for TNC to do an Efroymson style workshop for six WWF teams in 2006, it was this event that laid the ground work for TNC and WWF to come together in this partnership. As soon as John heard about the Coaches Network, he wanted to be a part of it and he wanted WWF to be a part of it. Since that time he has contributed to three Rallies, he has helped many WWF colleagues attend coach training, he has coached many processes all over the world and helped to write the network’s current strategic plan and develop the Partnership charter. He was the defacto leader of an informal WWF franchise before WWF joined the community. He participated in the Climate Clinic and continues to work to evolve our methods to better address climate change considerations and to improve the application of measures. John has never focused on any organizational differences or barriers. I had doubts, John never did. Always keeping his eyes on our shared goals. Our last recipient of the Coaches Network service award is always in the middle of the work we do to bring this community together. From Rally #1 to the present, her hard work, unique touches and great negotiating skills have made each of these gatherings not only possible but memorable events. No one gets the concept of working for the good of conservation first, without thinking about job titles or affiliations or credit better than this person. But because of her creativity and skill, she is always in demand and because her real job is supporting 2 executive directors in the Conservancy and planning the meetings for the Florida program and eastern region, you will find Barb Allison working late nights, early mornings and weekends for us. Why? You might wonder. Well, Barb doesn’t like mushy stuff but I know that she does this because she loves us and because she believes in what we are trying to do. One funny note here. Barb helped conceive of the concept of a service award, in fact she helped to design the actual award and she had no idea she was getting this. To the award winners, be grateful that you didn’t end up with pink flamingos! This Franchise leader has been setting the standard for that role since she agreed to become a co-leader of the first franchise ever formed the Pacific Islands Franchise. She was new to this whole conservation planning thing when she started her job with the Conservancy and Audrey Newman snagged her and made her part of this new network thing! And what she brought were fresh ideas and unflagging energy to the job of making this idea of cohorts of coaches in regional groups linked to a global network – actually real. She has been a key contributor to innovative adaptations of the CAP process for use in protected area planning. She has been a great connector – bringing in many new partners and organizations to her franchise. She has brought the coaches together in regional training events and she has contributed to sessions for every Network rally since the first. She has served as a member of the board strategic planning team for both the 2009 and 2012 plans, helping with evaluation and leading a working group. She has also been supporting the network as a whole by reaching out to her funding partners for support for Network coordination costs for the Rally. As the very busy Director of The Nature Conservancy’s Micronesia Challenge project – Trina Leberer has walked the walk in her conservation work – building one of the most successful large scale conservation projects and partnerships using the CAP/Open Standards framework as their planning guide. And she has seen the power of networking to get great work done in her home place while helping others of us around the world benefit from her enormous talent, great collaborative leadership skills and glorious positivity. Thank you Trina Leberer you are a true friend of this community. The next person began her association with the Coaches Network as a consultant for WWF, but in that position managed to steer WWF into collaboration with TNC in the coaching and support of the Open Standards. This was a critical moment in the evolution of CCNet. She left that position but was soon roped into working as FOS’ team member in Europe. There, she started one of the most active Franchises in the Network in 2010. Ilke Tilders has a very nurturing side to her. In her role as Franchise leader, she has made it a point of actively engaging and including students and young professionals in their cadre as well as seasoned conservation professionals. And she has reached out to and supported the new CCNet Africa Franchise as it starts to spread it’s wings. She has hosted a number of WebEx trainings and a regional rally to continue the learning and mentoring process for coaches. In these ways, Ilke is showing herself to be a true model of a collaborative leader and of someone who is looking not just to today but to the future well-being of our community. CCNet would not exist in Europe without her and would not be as strong around the world without Ilke Tilders’ contributions. Thank you, Ilke, for your leadership, innovation and inspiration. This master coach and franchise leader really ought to wear a shirt that says “yes we can.” A coach in the Network since 2005, she has gladly gone anywhere, done anything and taken on any challenge that was asked of her. Since the very beginning of the Efroymson Coaches Network, she has seen every challenge that has come up for the practice of 5S or CAP or the Open Standards or the Coaches Network as a great opportunity for learning and developing and said “put me in, Coach” in every game! From being the first coach to travel to Thailand to help a new coach partner implement a protected area planning process for the whole Western Forest Complex (a scale we had never attempted before) to accepting the lead of the Rocky Mountain Franchise and adding the orphaned Pacific NW to Alaska coaches under her wing, Terri Schulz is always ready to step up. In her own region, she has pioneered work in adapting CAP/Open Standards for application for the Bureau of Land Management planning and has been conducting training classes in the BLM’s training academy since 2008. She has traveled to China to share this experience with the coaches there as they were piloting their training program with the China Dept. of Forestry. And she has been part of the coach mentor team who has been supporting the great work unfolding in Mongolia which you heard about earlier today. Terri participated in the 2009 and 2012 strategic planning process. She has served on Rally planning teams. She serves as a Franchise leader representative on the CCNet Board Funding team and has ensured that the Rocky Mt./Pacific Franchise supports the network as a whole by hosting and participating as a trainer for a new coach training class and making sure the Rocky Mt. Franchise chips in to providing for core network support. Always positive, Terri’s response to any challenge is to cheerfully embrace it. Always starting with the question … “how will we do this?” Without a second of “Can we really do this?” From the grazing lands of Kenya to the steppes of Mongolia to the vast ranches of Colorado, Terri exemplifies the power and value of what can happen when you put an adaptable, practical tool into the hands of a seasoned, creative and sensitive practitioner who is willing to cross any cultural or physical barrier and humbly ask “can I be of some service?” For these things and many more, CCNet recognizes Terri Schulz for her selfless service to our community all over the world. This person has had an enormous positive influence on the depth and breadth of practice of adaptive management in general, and the Open Standards in particular – in NGOs, private foundations, and governments. In his dual roles with both the Conservation Measures Partnership and the Conservation Coaches Network, Nick Salafsky, has ensured that the links between CMP which developed the Open Standards, and CCNet, which represents the practitioners, were maintained. No one outside of Foundations of Success is really sure what it is. Is it a non-profit? Is it a new-age high-tech consultant? Is it a beltway bandit? Nevertheless, as one of the founders of Foundations of Success, Nick has set a standard of excellence in conservation planning and coaching, and is responsible for mentoring, training, and even hiring a number of great coaches in the Network. Nick has been a key participant in the design team for Miradi and a strong voice for results based management around the world. Nick has been an advocate for the Coaches Network since its early Efroymson Coaches Network days, he participated in every rally the network has held and was a key participant in the strategic planning process and development of the Partnership Charter that resulted in the evolution of the Efroymson Network to the Conservation Coaches Network. Nick has served as a board member in the Network for four years, representing FOS, in its role as a partner in the Network. He has been active in the latest plan for the network, serving on the core team and he serves on the Network’s funding team. He has been instrumental in ensuring that FOS provides important financial and in-kind support for CCNet and CCNet initiatives. FOS staff were instrumental in the last two CCNet coach trainings in Florida and Kenya. Thank you Nick from all of us, for all you’ve done for this movement and for our community! Don’t let this next guy fool you. He wants you to think he is a big, strong tough guy with not too much going on upstairs, but if you push that exterior façade aside – what you would find is a huge, soft heart, a gentle and generous nature and a brilliant strategic brain all pulsing with very green blood. Yes, it is because of Stuart Cowell’s genius that CAP/Open Standards has been morphed into the “Healthy Country planning” framework – an adaptation which is designed to help local communities design a sustainable future for their themselves and all life that will come after them. By teaching others how to use this adaptation and serving as a resource and cheerleader, Stuart is doing everything he can to support the great transformational work being done by local communities and Indigenous peoples of Australia to go back “on country.” These efforts of the original people of Australia using Healthy Country Planning is having such encouraging results, the Indigenous Protected Area Program of the Australian government has endorsed the approach and encouraged its use across the entire continent. Stuart is such an eager student. He is all ears when anyone is willing to offer any idea or new way of thinking, because of this trait, he took to the concept of a Coaches Network learning community without any hesitation. He has been one of the most ardent supporters of the Network in Australia (which includes now coaches from 14 organizations – and a few who are not affiliated to an organization, like Stuart!). Stuart contributes to the development and nurturing of the Australian franchise in so many ways including very actively identifying and recruiting new coaches; contributing to the Australia Franchise’s strategic planning process; being lead coach for numerous planning workshops – always bringing newer coaches along with him to help and learn; serving as a regional resource for the coaches from northern Australian; and leading new coach training workshops. He has led three new coach training workshops for CCNet which included practitioners from all over Australia, the eastern hemisphere and Hawaii. And he recently launched a new facebook community for the Australian coaches which we hope will inspire others of us to follow suit. Stuart is a passionate voice for the rigor of our practice, strongly advocating for the critical importance of conducting a disciplined viability analysis and embracing the importance of measures and doing so in a style that honors western and traditional ways of knowing. If we had an award for “ones to watch” in this field, it would go to Stuart. As no doubt, given his incredible energy and passion for this work, he has so much more he will lead and do in the years to come. Stuart couldn’t join us for Rally 2013. But we honor his contributions and by this award, we thank you, Stuart, for all you are doing to serve the Coaches Community. If you tug on any string that you find in this Open Standards movement, you will find this person on it at some point along the way. He was one of the original thinkers who put together the basic framework of 5S – which was the seed corn for the open standards. He has been not just the agitator about the importance of measuring and learning from what we do but he has been the guy slugging it out in the trenches trying to figure out how to make measures real and operational. He has been there for the birth of the idea of “open standards” and has launched and carries the effort to evolve software programs and databases to share and learn together in this computer age forward – never seeming to tire from the heavy lift. And this string we all hold together today – The Conservation Coaches Network – woven for the purpose of building capacity for supporting teams in effectively applying results based management would not exist without Dan Salzer’s contributions. He gave us our first collection of materials, assembling all the different aids in one easy to use disk – he created our first web space on Conserveonline and has played an instrumental role with both the CAP Excel workbook and Miradi. He helped us to understand so many of the newest ideas – breaking things like viability into bite size chunks so well that even the most reluctant of us – got it into our thick skulls! He has been our trainer, our cheerleader, our innovator, our subject maven on so many different aspects of the practice. Like a switch board operator, he has fielded all of our frantic calls for help – sending us papers, responses, ppts, suggestions, feedback – all kinds of answers to our endless questions by phone, email, or in person. He has served as an unpaid member of the coordinating team and an advisor to the board of the Coaches Network since its inception. He has helped with every Rally – on planning teams, providing wonderful sessions and pushing for funding for people who couldn’t otherwise afford to attend. And he has done this always because no one, not one person in this room can claim to believe in this idea of an open source way to work in the field of conservation more than Dan Salzer. We honor him today in this small way. How I wish we had a special award for Dan. He deserves so much. Someday the movement may have an award named after him but for now, join me in thanking Dan Salzer. There is no one quite like him. Our first recipient always believed in the power of a common language for conservation and it was likely his business background that prompted him to reason that conservation would be much more efficient and effective if we were attentive to measuring results and learning from experience. Given this awareness, this recipient was instrumental in the births of the Open Standards (in his contributions to the early work with 5S/CAP), the Efroymson Coaches Network and the Conservation Measures Partnership. He was ever a champion of the Coaches Network. The first Franchise sponsor/leader in the Efroymson Coaches Network, he has always believed in the value of capacity building, sharing and learning across cultures, organizations and geographies. This is no doubt the result of his experiences as one of the first people in The Nature Conservancy to venture into international conservation. He has always been a spokesperson for the Network, his wise and gentle voice was heard at our earliest Rallies addressing the coaches in plenary and still today provides thoughtful council for every board decision that we make as a community. When Brad Northrup retired from The Nature Conservancy after years of extraordinary service in almost every level of the organization from chapter to region to International to VP for the organization as a whole, imagine how happy we all were when he so graciously agreed to serve as CCNet’s 1st real official chairperson. It would be almost impossible to exaggerate the value that he brings to this role and to our community. He has steered the Network through uncertain waters, led our strategic planning process, diligently worked to ensure the Network has operating funds, led the Network through a significant growth spurt in coaches and welcomed new franchises. He is ever humble and warmly receives everyone as a peer. He is always eager to learn from all of us and believes that each and every one of us can make a difference with our abilities as coaches. CCNet could have no better cheerleader, champion, friend, example, mentor, Father or Chairperson. We humbly offer this recognition award to Brad Northrup for his selfless service to the Conservation Coaches Network. He was first introduced to the Open Standards in France, in a multi team workshop and loved it. He loved the method, he loved the approach of training, he loved the friendship among the coaches. He loved it so much – that he and through him his organisation the Fundacion La Pedrera- hosted a multiteam workshop, 6 teams, 60 people in Deltebre (the Ebro Delta). Coaches and participants loved the event – and loved of course Xavi. So much so, that European coaches for a while considered appointing him as a teddybear mascot. After all, he has that Paddinton profile: an endangered species (in his case Catalan), smiling, warm & friendly, ready to help where needed, able to growl when annoyed. Instead he became one of the three CCNET Europe leaders and as such is smiling, warm and friendly, able to growl and helping whenever possible. A great example of this is the fact that CCNet is now having its first global coach rally in Europe, here at Mont St. Benet. Xavi has worked hard to make this happen! As a “supercoach,” Xavi has inspired teams in Spain and other countries in Europe. He has worked in Spain on issues related to mountains, connectivity and vultures. Xavi has used his vacation time to support two coach trainings so far, one in Europe and one in Cameroon (though probably more that I am not aware of). Xavi is a terrific coach trainer and has taught his fellow trainers much. Suffice it to say that IF Xavi is one of your coach trainers, THEN you will be a better coach! We are extremely grateful for all that Xavi has given CCNet – his energy, his talent, his friendship- and we look forward to many more happy years working together. This recipient of the Conservation Coaches Network Service Award was one of the first coaches in the Network. She is a Master coach – having supported teams all over the world – planning for such iconic species as the Chimpanzees of Tanzania and iconic places like the Gulf of California. She has supported coach training since 2005 and she is always ready to gently mentor and support all of us in any capacity (in front of or behind the scenes). Her gracious and collaborative style, coupled with her exceptional competence and diverse experience, make her the person that we all want on our working groups and task forces. She played an active role in every major strategic plan that the Network has done. She translated many of our materials into Spanish, helped write at least two manuals for use in Latin American countries, served on the Human dimensions working group, and helped develop the new web site. She started and manages our list serve and captures our stories and accomplishments in our e-magazine. She has contributed in many key ways to every one of the Rallies that this community has held and led the last two Coaches Rally planning teams to design and implement wonderful inclusive events – full of creativity, fun and great opportunity for learning. There is hardly any aspect of our community that doesn’t have her gentle and competent fingerprints on it somewhere. She is all of our colleague, sister, friend, teacher, and leader. 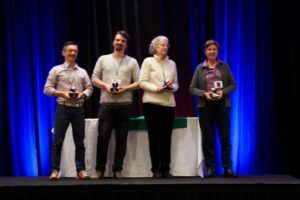 In truth, Cristina Lasch is the post child for what it means to be a “servant leader.” It would be hard, impossible really to ever thank, Cristina, for her service to the Conservation Coaches Network and most of all for her example. Cristina, you exemplify all that is good about our Network. We thank you and we recognize you with this Award. Our first recipient was introduced to the Open Standards as a university student. He seemed to take to the approach immediately, and became involved in the European franchise in its early days as a volunteer. He has been volunteering for things CCNet ever since, and his fingerprints can be seen all over CCNet. He is still a major driver of the CCNet European franchise – including in their new manifestation as an independent non-governmental organization. He is content to take on low profile but difficult tasks. He is leading an effort to revamp the basic Powerpoint sets that we all use to teach the Open Standards. He was an important force as a volunteer at both the Georgia and Spain coach rallies. And he has been an important part of this rally – helping to set up CCNet’s first crowdfunding drive to provide funds to cover the expenses of coaches from developing countries. Conservation Coach, Father, top-notch photographer, fossil hunter, shark scuba diver, distiller, NGO leader making climate-friendly stoves in Africa – Felix Cybulla is widely believed to be the actual prototype for the world’s most interesting man. Our next recipient has been involved with the Open Standards for a long time. She has worked for a leading non-profit for almost two decades, leading dozens of OS-based planning processes around the world – adeptly navigating complex situations in both English and Spanish. She also led the development of Results Chains as a graphical tool for modelling theories of change — can you imagine an OS world without Results Chains????! In recent years, she has carried her personal passion to deal with climate change head on into her Open Standards work, where she is helping to develop practical tools to help teams figure out how to address climate change in projects and programs. She is very experienced, and can handle virtually any planning situation. Our next recipient plays a unique role in CCNet. Never believe that a CCNet Champion needs a “conservation” background. In the early 2000’s our recipient became the Finance Manager at Bush Heritage Australia. With a background in IT and organisational strategy over the next few years she identified the need for a more systematic approach to documenting and adapting conservation projects and her search for a solution led her to the Open Standards for Conservation. In order to implement the changes she dreamed of, she transferred into the conservation team and set about quietly transforming the organisation. She is a role model when it comes to institutionalizing the Open Standards and providing guidance for others. She has been so successful that the rest of us can only wonder how she does it – although her capacity to reach out and garner help from others with similar interests stands out as a key factor. She is a pioneer of 24 hour effort – work on it in Australia and pass back through to the northern hemisphere…. Her accomplishments have led to the best example of organization-wide adoption of the Open Standards among all conservation organizations globally. She played a key role in many aspects of the adoption effort including building a compelling case with senior management, creating written guidance materials, providing training and support to local project teams, and developing innovative technical solutions that led to more efficient use of the Open Standards and automating the delivery of compelling reports to key audiences. She has marshaled the benefits of the touch-once approach of Miradi Desktop and the transparent sharing of Bush Heritage’s work through Miradi Share better than any other organization. These technical solutions represent important breakthroughs in addressing key barriers to Open Standards adoption. During her 2016 Fulbright Scholarship she traveled extensively and interviewed staff from many organizations. During her travel she ended up directly assisting many organizations, sharing lessons learned from her own work with Bush Heritage and helping others overcome Open Standards implementation challenges. Annette Stewart stands out as a shining ambassador for the CCNet Australia franchise and the whole Open Standards movement around the world. I believe that it is fair to say that he is one of the, if not the, most experienced Open Standards coach practicing in both of those geographies. 4. His own personal mentoring program for emerging conservation coaches – he has taken it upon himself to contribute to the growth of three lucky people, providing them with opportunities and his hard-won wisdom. He has volunteered as a trainer, without compensation, in two coach trainings.